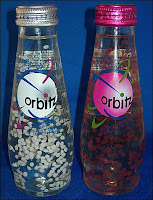 OK, this isn't a '70s and '80s product...ORBITZ soda, with the little balls in it, came out in the '90s. But it's been gone so long I feel a little nostalgic for it anyway. Kind of a predecessor to bubble tea. I mean, bubble tea might have been around first, but weird gummy little snacks in beverages? Orbitz trained us to like bubble tea. Which I don't, actually. But I like the concept of bubble tea, so...halfway there. Don't Google Orbitz now and expect the beverage, by the way. The name has been seized by the travel site.